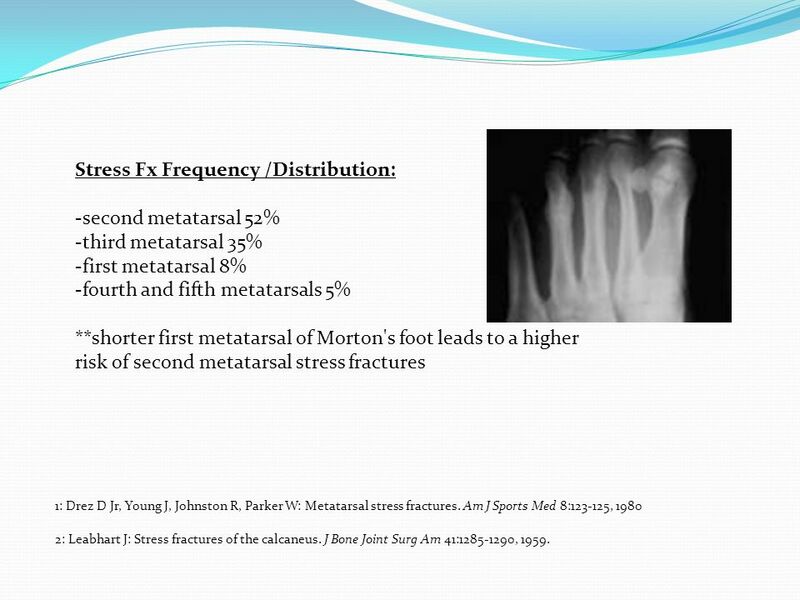 -third metatarsal 35% -first metatarsal 8% -fourth and fifth metatarsals 5% **shorter first metatarsal of Morton's foot leads to a higher risk of second metatarsal stress fractures 1: Drez D Jr, Young J, Johnston R, Parker W: Metatarsal stress fractures. Am J Sports Med 8: , 1980 2: Leabhart J: Stress fractures of the calcaneus. J Bone Joint Surg Am 41: , 1959. 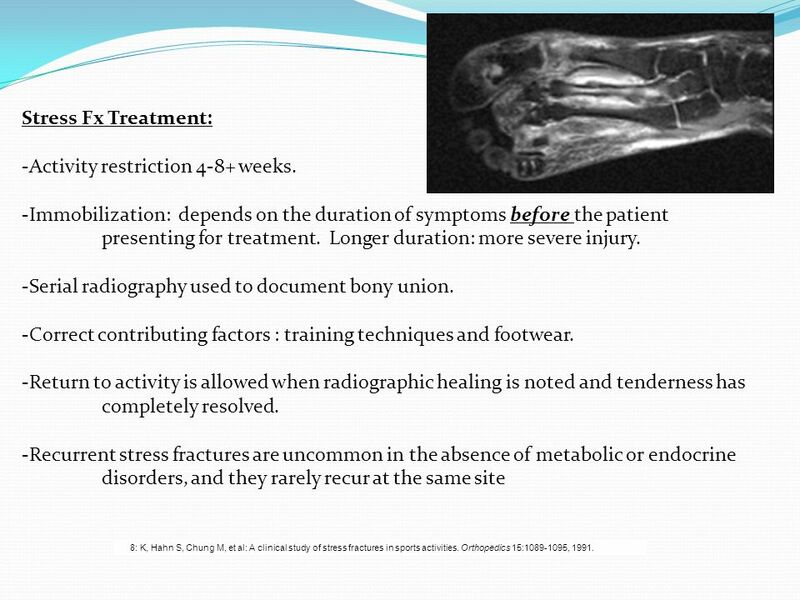 -cavus foot conformation -long second metatarsal (e.g. Morton's foot) -metatarsus adductus -amenorrhea (hypoestrogenism) -hyperthyroidism -osteoporosis -medications -tobacco -alcohol abuse -nutritional problems -anemic disorders -training errors -poor footwear -improper athletic technique 3: Daffner R, Pavlov H: Stress fractures: Current concepts. Am J Radiol 159: , 1992. - Microfractures  Stress Reactions  Cortical Fracture. 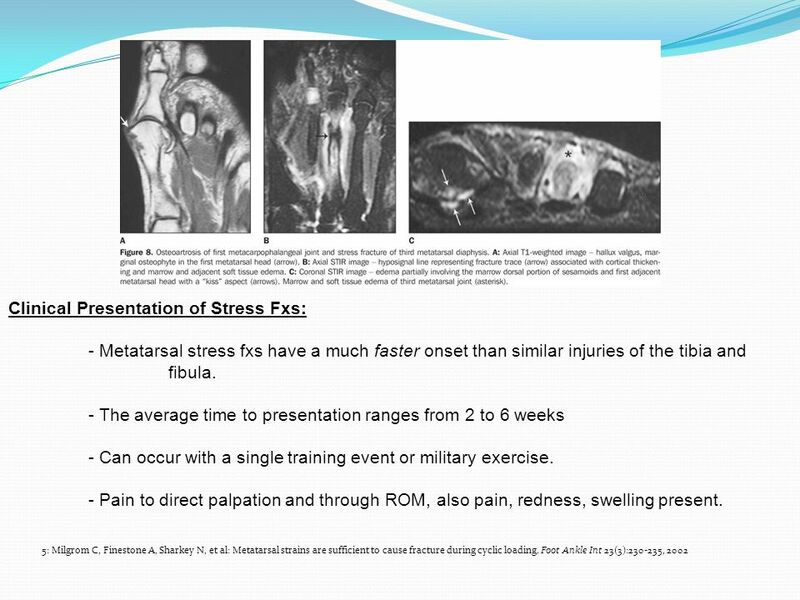 - Stress fxs occur by cyclic loading that does not exceed the ultimate breaking limits of plastic deformation of bone. - One possible cause of stress fracture is muscle fatigue, which decreases shock-absorbing capacity of the extremity. 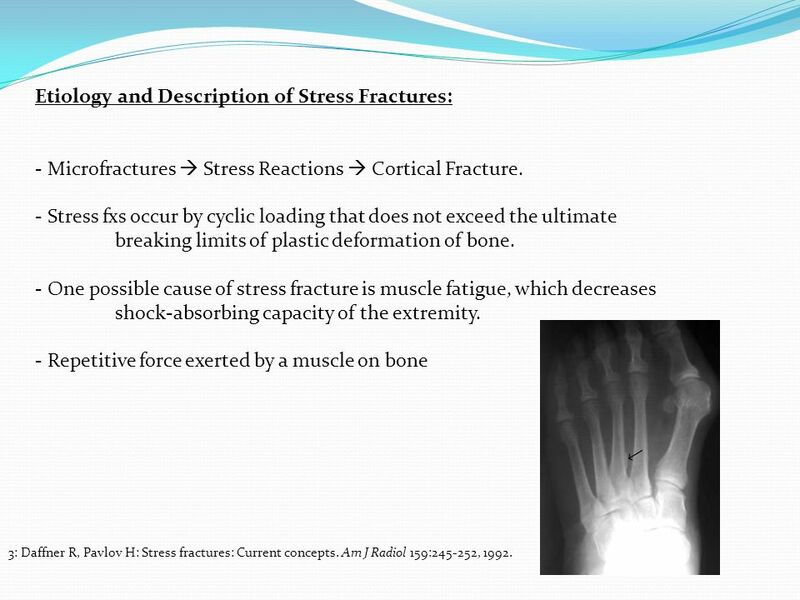 - Repetitive force exerted by a muscle on bone 3: Daffner R, Pavlov H: Stress fractures: Current concepts. Am J Radiol 159: , 1992. Dorsal strains are significantly reduced by contraction of the plantar flexory musculature. 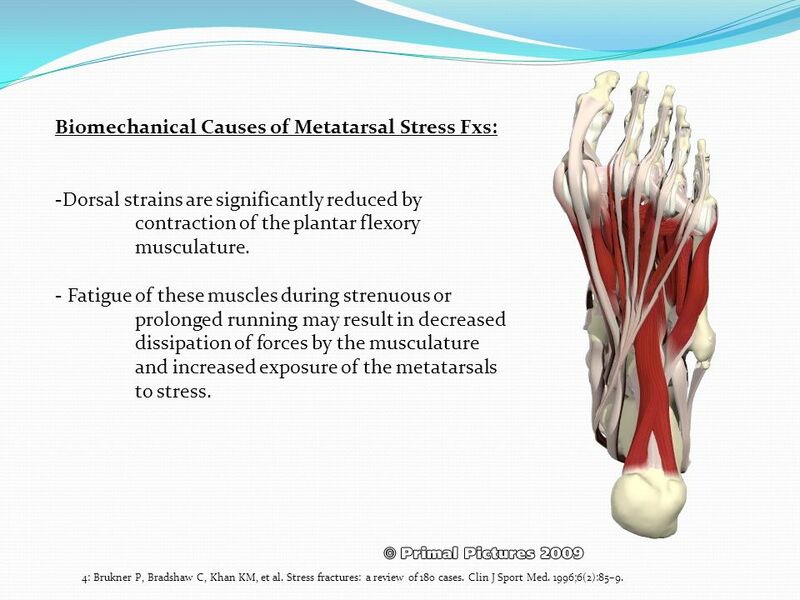 - Fatigue of these muscles during strenuous or prolonged running may result in decreased dissipation of forces by the musculature and increased exposure of the metatarsals to stress. 4: Brukner P, Bradshaw C, Khan KM, et al. 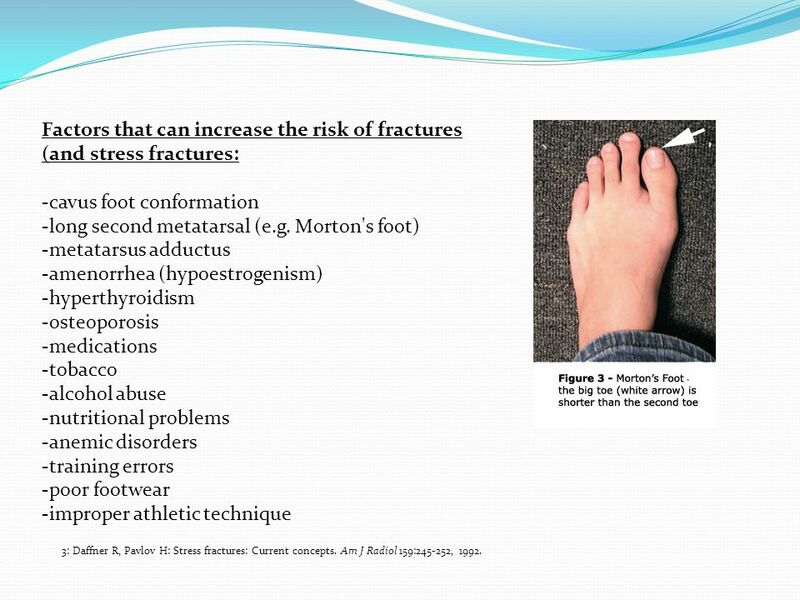 Stress fractures: a review of 180 cases. Clin J Sport Med. 1996;6(2):85–9. -Plain films may not show changes for > 10 days. Changes may be evident in only 30% to 70% of cases. -Bone Scan: 99Tc bone scan is extremely sensitive, and uptake may be evident within 24 hours of injury (not specific however) . -MRI is highly sensitive and specific, particularly to identifying location. -CT is helpful to define a fx line and to determine whether the fx is complete or incomplete. 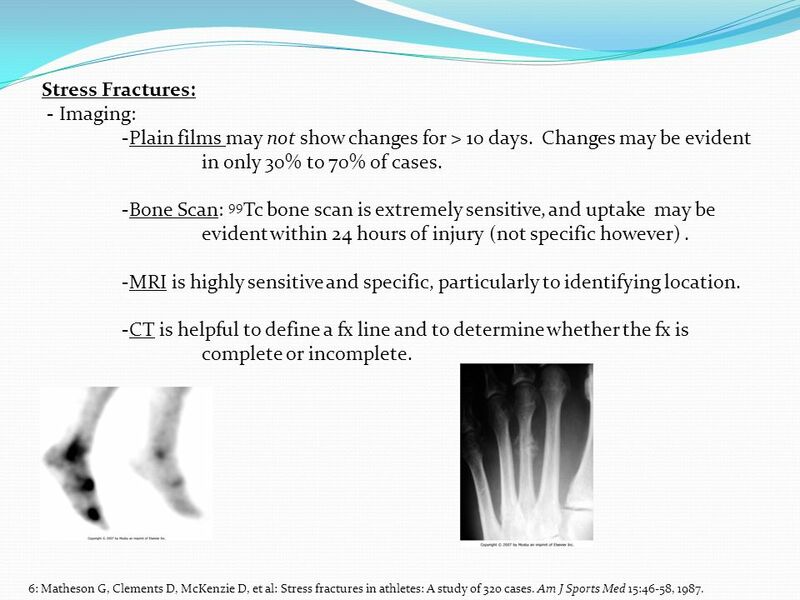 6: Matheson G, Clements D, McKenzie D, et al: Stress fractures in athletes: A study of 320 cases. Am J Sports Med 15:46-58, 1987. -Forty-one feet were analyzed with US and dedicated MRI from 37 patients. -MRI detected 13 fractures in 12 patients. -US was 83% sensitive, 76% specific. Positive predictive value 59%, and negative predictive value 92%. 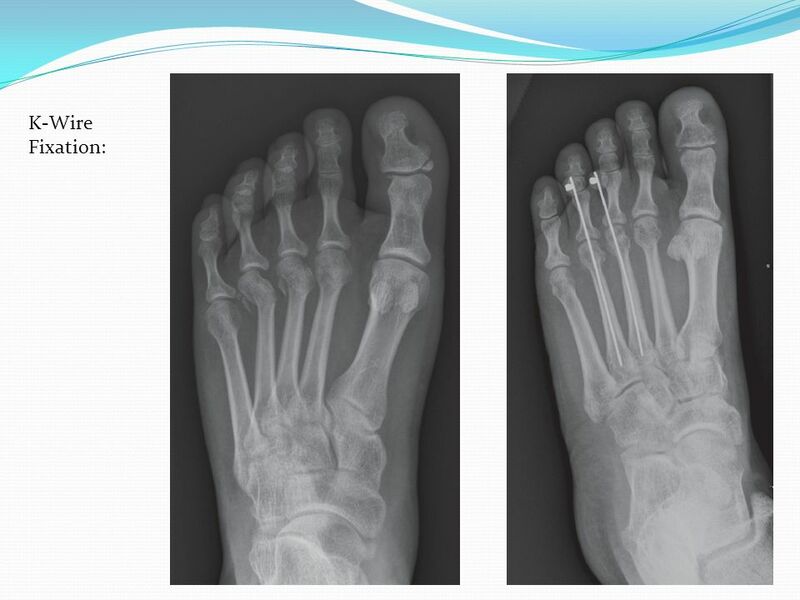 -In cases of normal radiographs, US is indicated in the diagnosis of metatarsal bone stress fractures, as it is a low cost, noninvasive, rapid, and easy technique with good sensitivity and specificity. 7: F Banal, F Etchepare, B Rouhier, C Rosenberg, V Foltz, S Rozenberg. Ultrasound ability in early diagnosis of stress fracture of metatarsal bone. Ann Rheum Dis July; 65(7): 977–978. 9 -Activity restriction 4-8+ weeks. Stress Fx Treatment: -Activity restriction 4-8+ weeks. -Immobilization: depends on the duration of symptoms before the patient presenting for treatment. Longer duration: more severe injury. Serial radiography used to document bony union. Correct contributing factors : training techniques and footwear. Return to activity is allowed when radiographic healing is noted and tenderness has completely resolved. Recurrent stress fractures are uncommon in the absence of metabolic or endocrine disorders, and they rarely recur at the same site 8: K, Hahn S, Chung M, et al: A clinical study of stress fractures in sports activities. Orthopedics 15: , 1991. 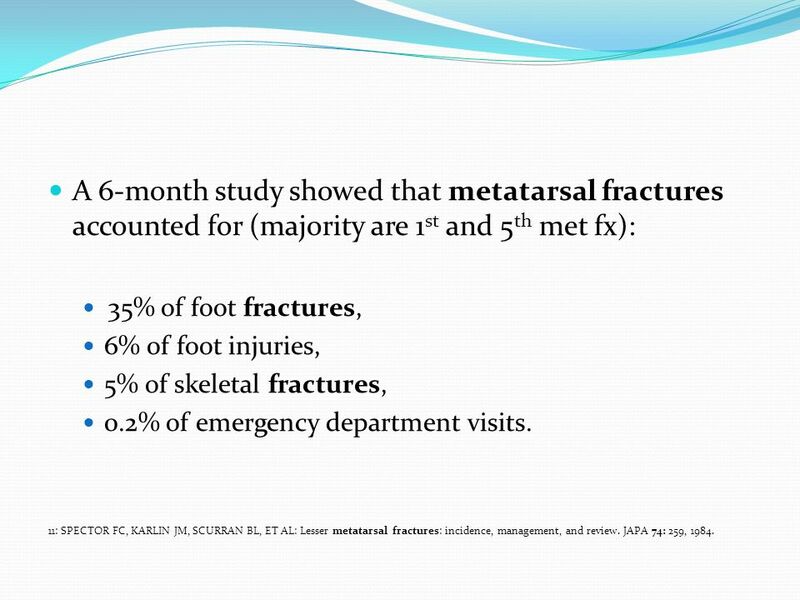 35% of foot fractures, 6% of foot injuries, 5% of skeletal fractures, 0.2% of emergency department visits. 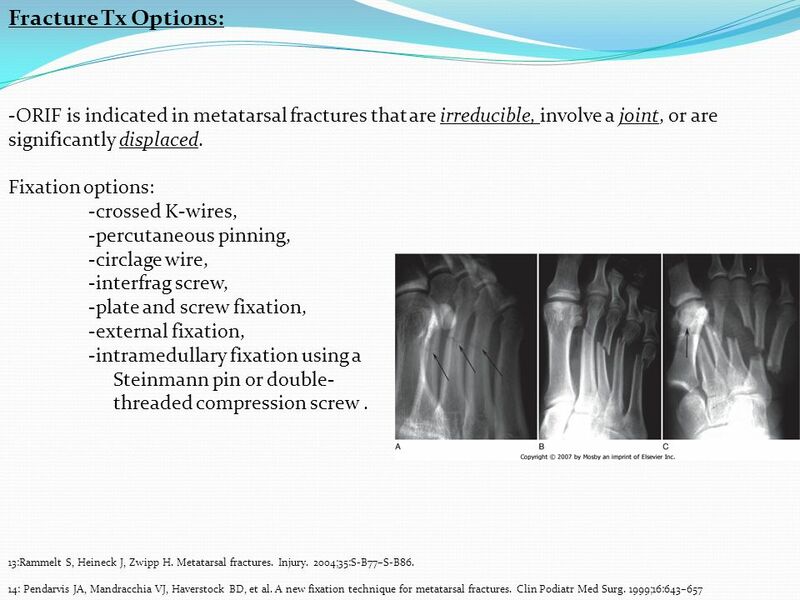 11: SPECTOR FC, KARLIN JM, SCURRAN BL, ET AL: Lesser metatarsal fractures: incidence, management, and review. JAPA 74: 259, 1984. 13 Surgical Approach: consider the complex soft tissue anatomy that surrounds, inserts or originates from each of the central metatarsals. 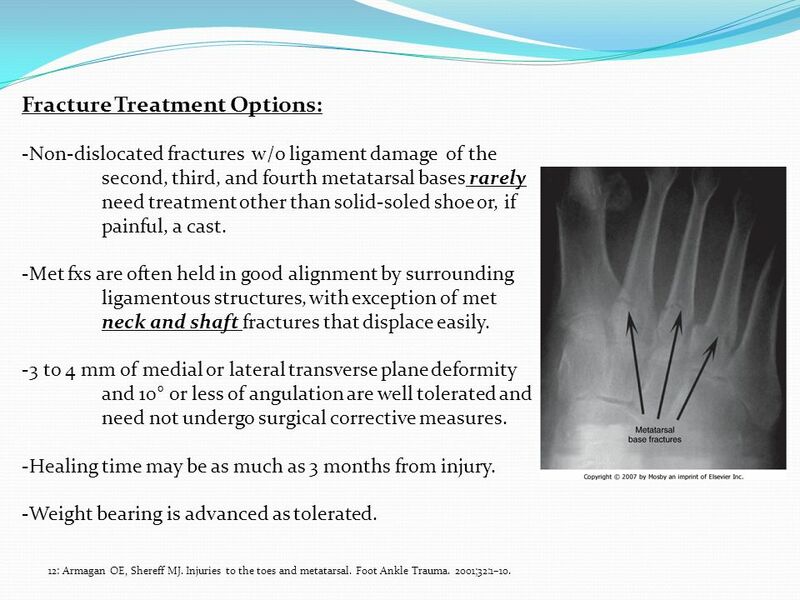 14 -Fractures of the proximal shaft and base must be evaluated for ligamentous disruption. - Manipulation under anesthesia while monitoring with fluoroscopy is recommended. Non-dislocated fractures w/o ligament damage of the second, third, and fourth metatarsal bases rarely need treatment other than solid-soled shoe or, if painful, a cast. Met fxs are often held in good alignment by surrounding ligamentous structures, with exception of met neck and shaft fractures that displace easily. 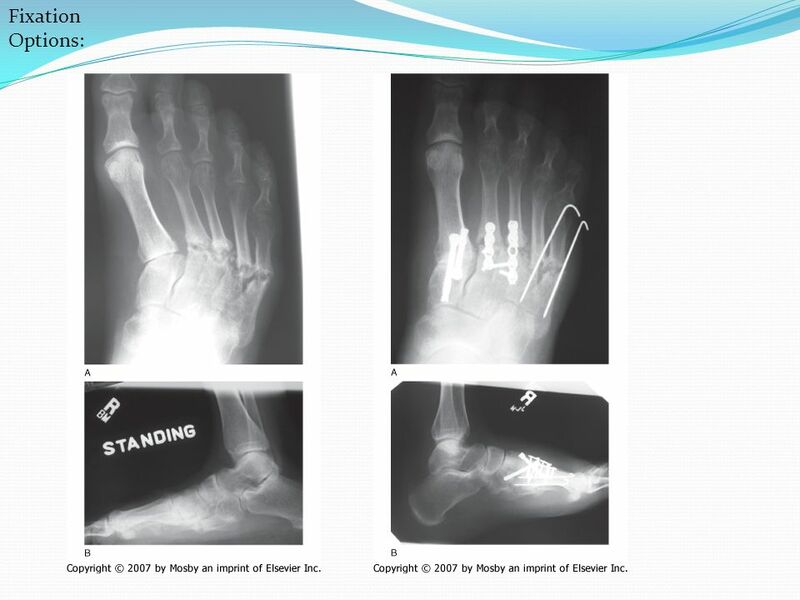 3 to 4 mm of medial or lateral transverse plane deformity and 10° or less of angulation are well tolerated and need not undergo surgical corrective measures. Healing time may be as much as 3 months from injury. Weight bearing is advanced as tolerated. 12: Armagan OE, Shereff MJ. Injuries to the toes and metatarsal. Foot Ankle Trauma. 2001;32:1–10. -None -Didley Squat -Zilch *Best evidence available is “author’s experience”. 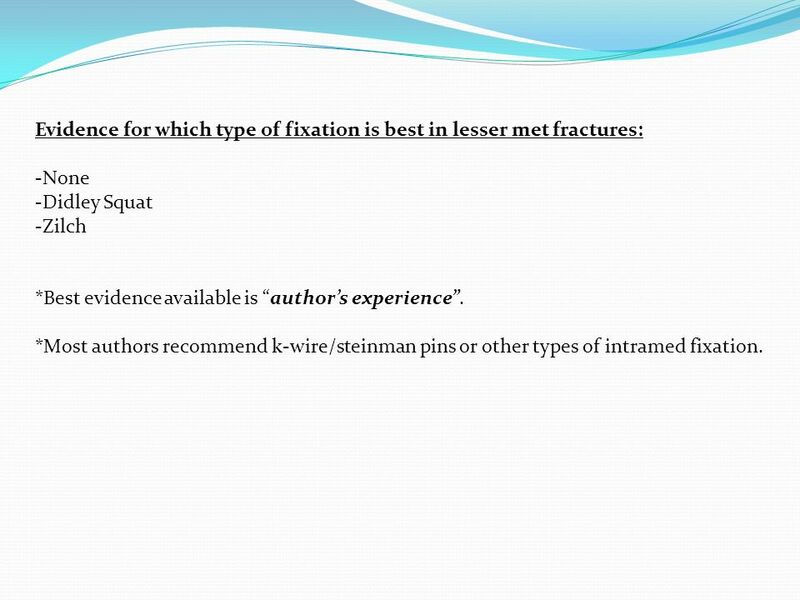 *Most authors recommend k-wire/steinman pins or other types of intramed fixation. -40 bone models were divided equally into 4 groups: a control group consisting of intact lesser rays; and Weil osteotomies that were fixated with 2 crossed Kirschner wires (0.045-in K-wires), 2.0-mm cortical screws, or cannulated 2.4-mm cortical screws. 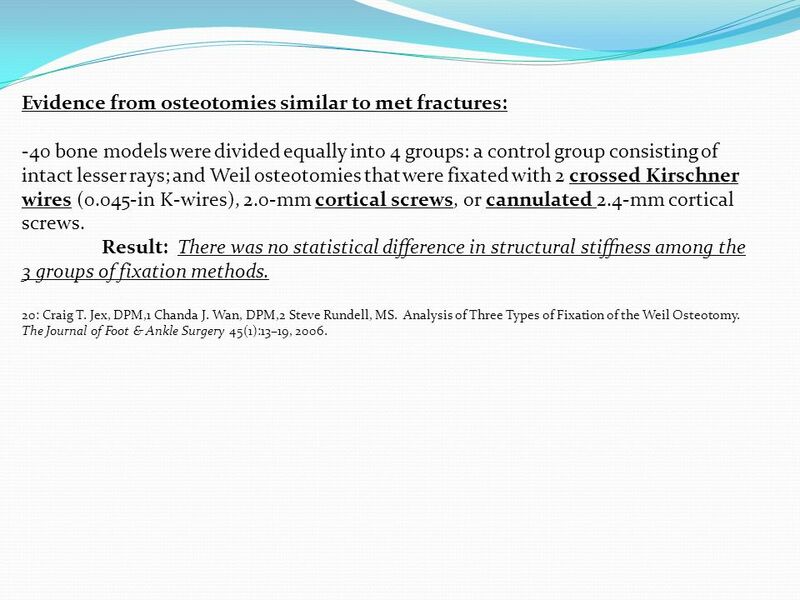 Result: There was no statistical difference in structural stiffness among the 3 groups of fixation methods. 20: Craig T. Jex, DPM,1 Chanda J. Wan, DPM,2 Steve Rundell, MS. 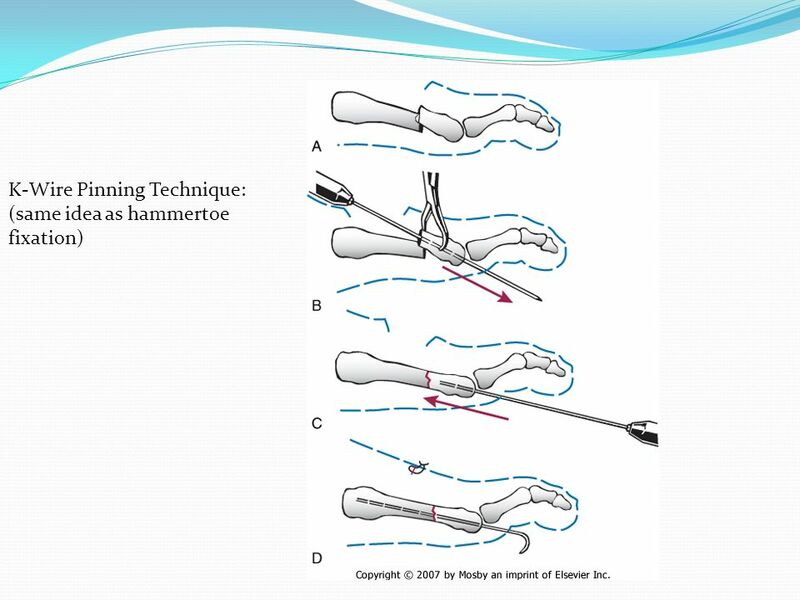 Analysis of Three Types of Fixation of the Weil Osteotomy. The Journal of Foot & Ankle Surgery 45(1):13–19, 2006. 22 -Kirschner wire for provisional stability. Comminuted Fxs: -Kirschner wire for provisional stability. 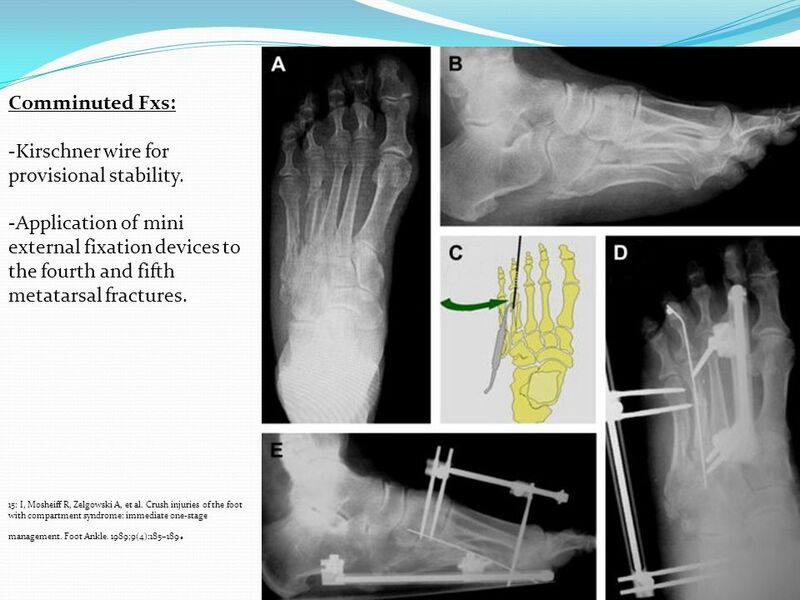 -Application of mini external fixation devices to the fourth and fifth metatarsal fractures. 15: I, Mosheiff R, Zelgowski A, et al. Crush injuries of the foot with compartment syndrome: immediate one-stage management. Foot Ankle. 1989;9(4):185–189. 25 Fixation Options: plate and screws. 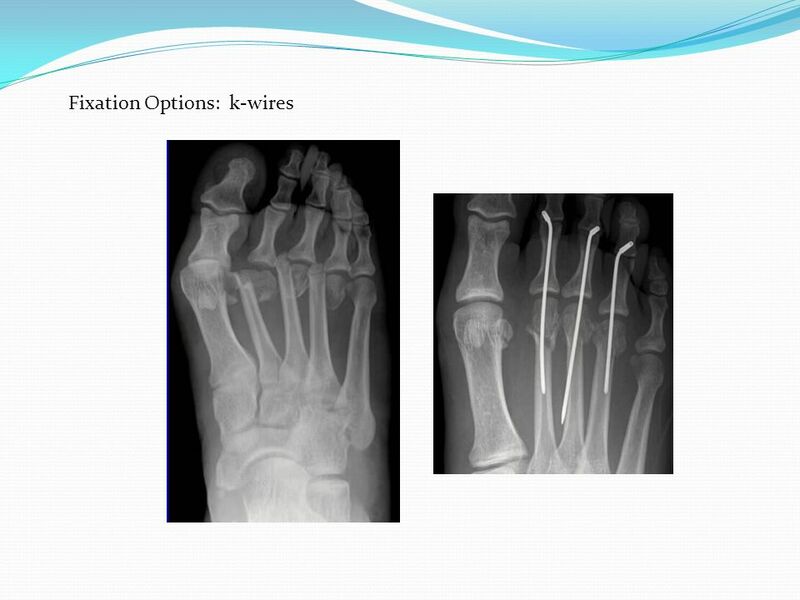 26 Fixation Options: k-wires, plate and screws. 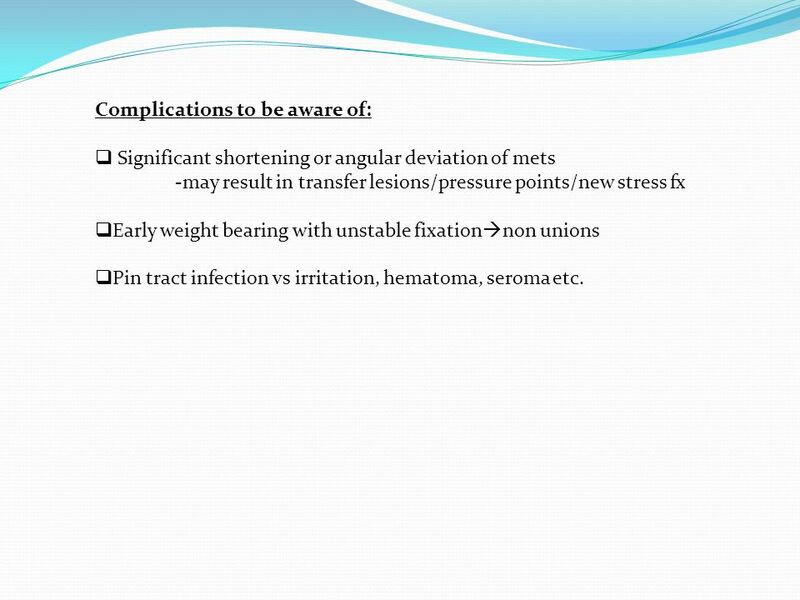 Significant shortening or angular deviation of mets -may result in transfer lesions/pressure points/new stress fx Early weight bearing with unstable fixationnon unions Pin tract infection vs irritation, hematoma, seroma etc. 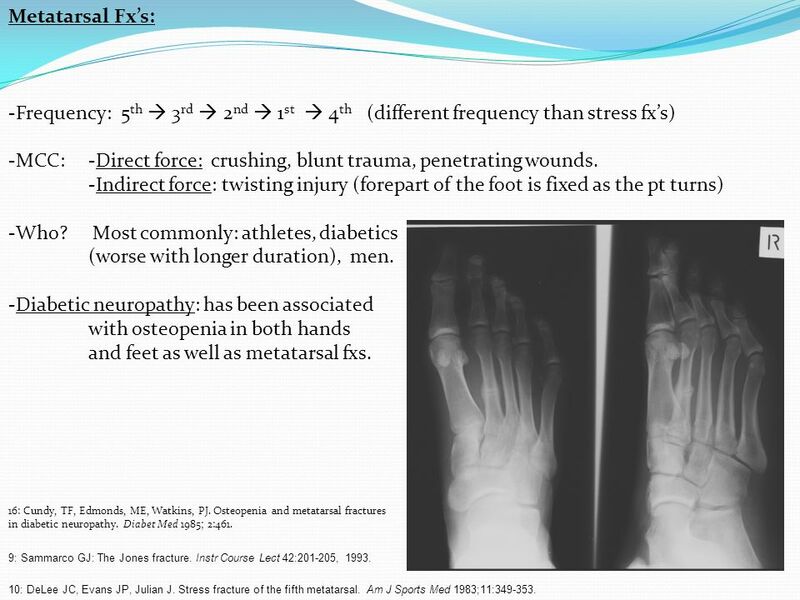 28 References: 1: Drez D Jr, Young J, Johnston R, Parker W: Metatarsal stress fractures. Am J Sports Med 8: , 1980. 2: Leabhart J: Stress fractures of the calcaneus. J Bone Joint Surg Am 41: , 1959. 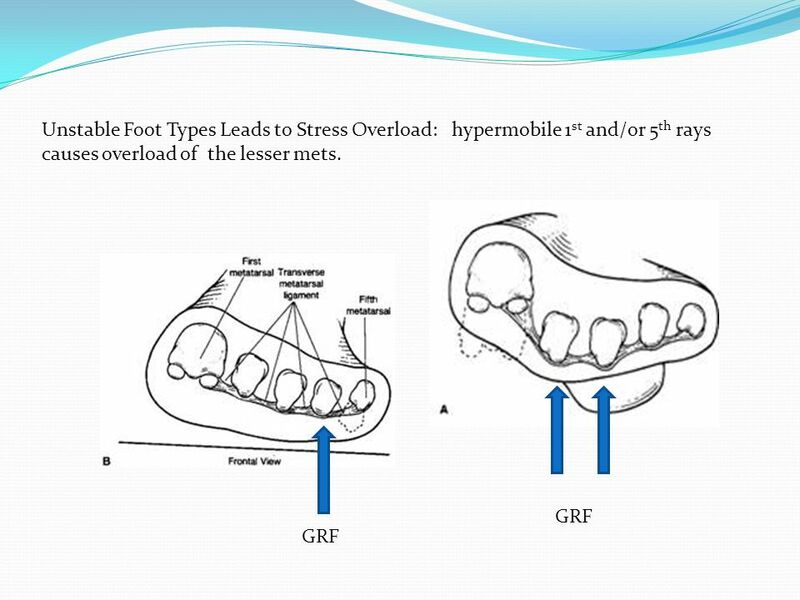 3: Daffner R, Pavlov H: Stress fractures: Current concepts. Am J Radiol 159: , 1992. 4: Brukner P, Bradshaw C, Khan KM, et al. Stress fractures: a review of 180 cases. Clin J Sport Med. 1996;6(2):85–9. 5: Milgrom C, Finestone A, Sharkey N, et al: Metatarsal strains are sufficient to cause fracture during cyclic loading. Foot Ankle Int 23(3): , 2002 6: Matheson G, Clements D, McKenzie D, et al: Stress fractures in athletes: A study of 320 cases. Am J Sports Med 15:46-58, 1987. 7: F Banal, F Etchepare, B Rouhier, C Rosenberg, V Foltz, S Rozenberg. 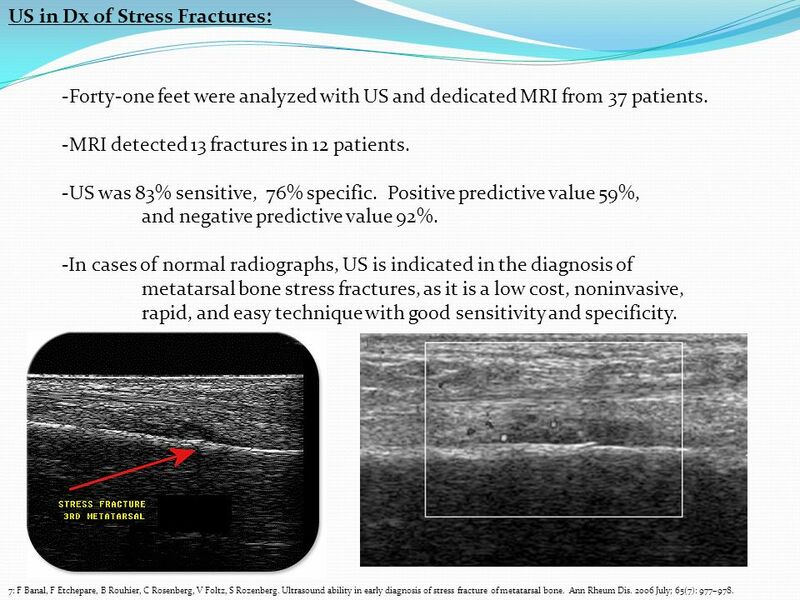 Ultrasound ability in early diagnosis of stress fracture of metatarsal bone. Ann Rheum Dis July; 65(7): 977–978. 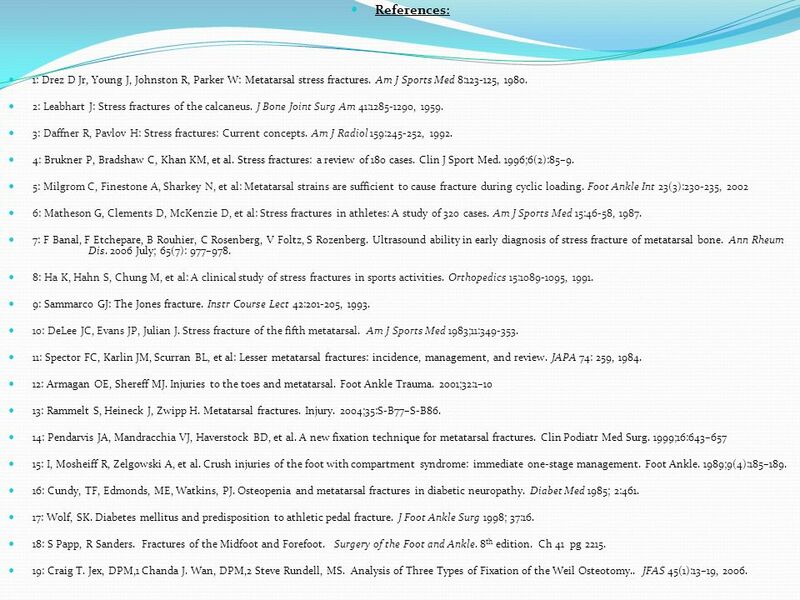 8: Ha K, Hahn S, Chung M, et al: A clinical study of stress fractures in sports activities. Orthopedics 15: , 1991. 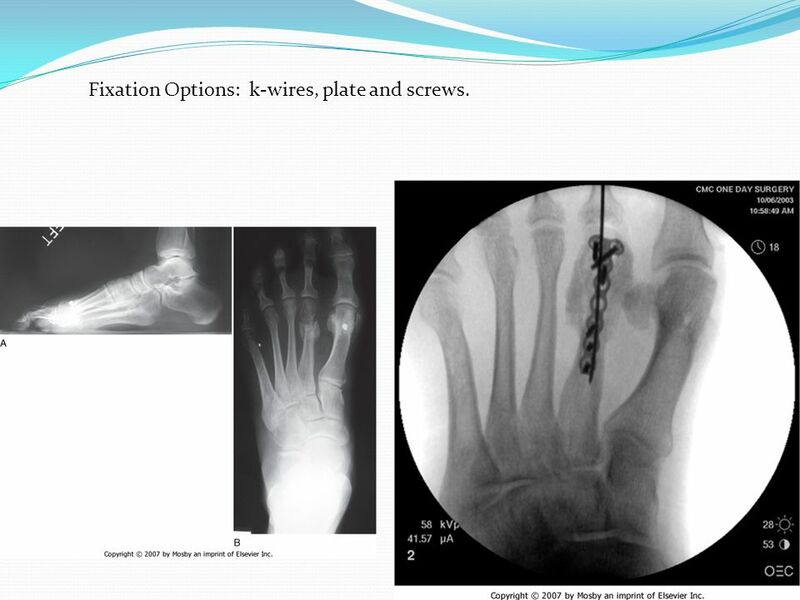 9: Sammarco GJ: The Jones fracture. Instr Course Lect 42: , 1993. 10: DeLee JC, Evans JP, Julian J. Stress fracture of the fifth metatarsal. Am J Sports Med 1983;11: 11: Spector FC, Karlin JM, Scurran BL, et al: Lesser metatarsal fractures: incidence, management, and review. JAPA 74: 259, 1984. 12: Armagan OE, Shereff MJ. Injuries to the toes and metatarsal. Foot Ankle Trauma. 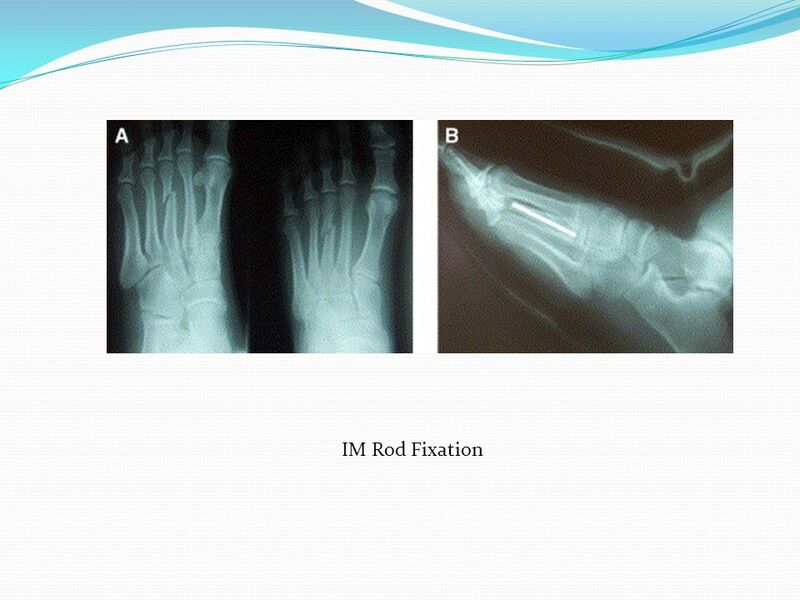 2001;32:1–10 13: Rammelt S, Heineck J, Zwipp H. Metatarsal fractures. Injury. 2004;35:S-B77–S-B86. 14: Pendarvis JA, Mandracchia VJ, Haverstock BD, et al. 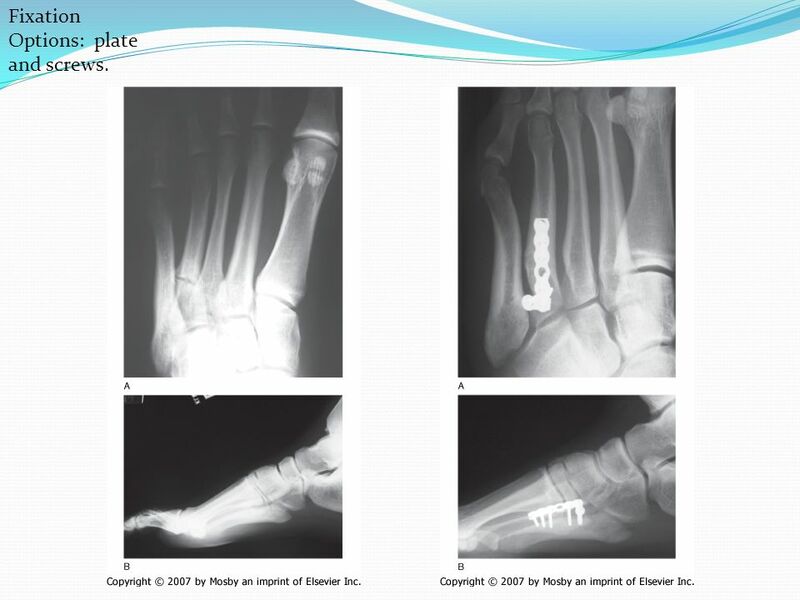 A new fixation technique for metatarsal fractures. Clin Podiatr Med Surg. 1999;16:643–657 15: I, Mosheiff R, Zelgowski A, et al. Crush injuries of the foot with compartment syndrome: immediate one-stage management. Foot Ankle. 1989;9(4):185–189. 16: Cundy, TF, Edmonds, ME, Watkins, PJ. Osteopenia and metatarsal fractures in diabetic neuropathy. Diabet Med 1985; 2:461. 17: Wolf, SK. Diabetes mellitus and predisposition to athletic pedal fracture. J Foot Ankle Surg 1998; 37:16. 18: S Papp, R Sanders. Fractures of the Midfoot and Forefoot. 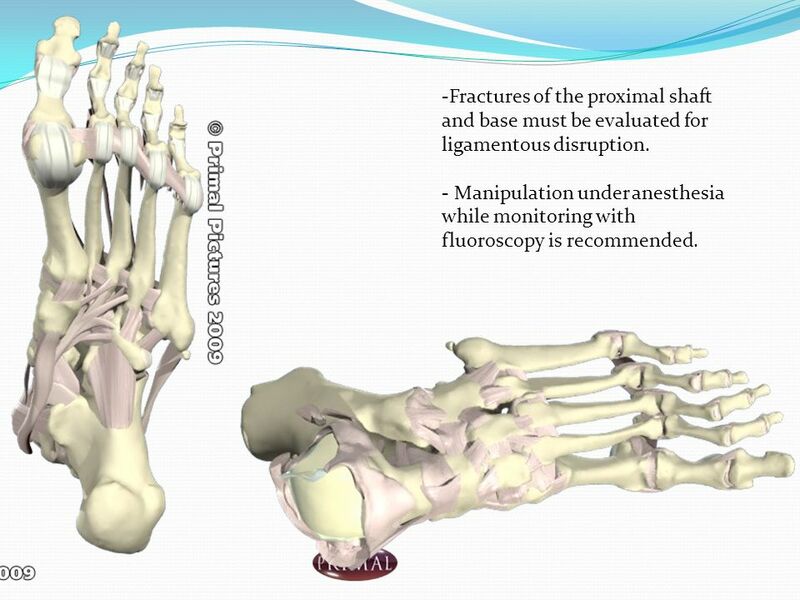 Surgery of the Foot and Ankle. 8th edition. Ch 41 pg 2215. 19: Craig T. Jex, DPM,1 Chanda J. Wan, DPM,2 Steve Rundell, MS. Analysis of Three Types of Fixation of the Weil Osteotomy.. JFAS 45(1):13–19, 2006. 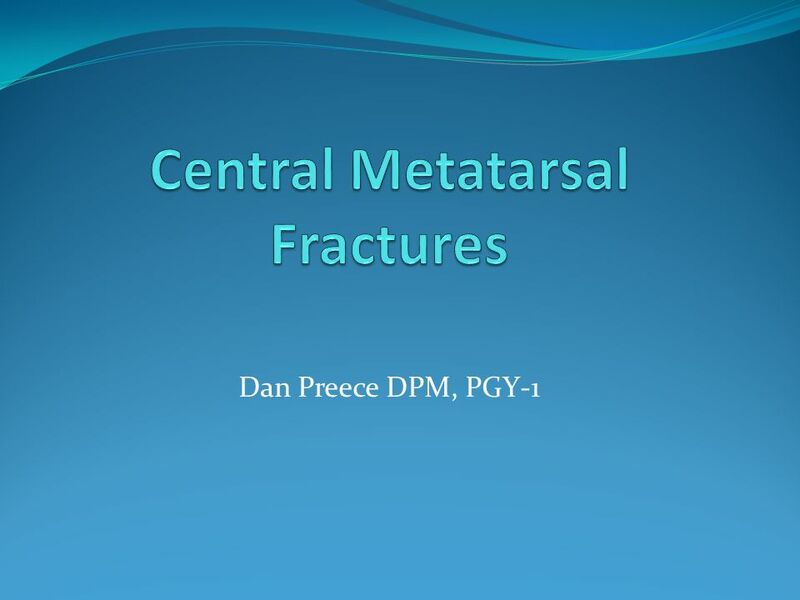 Download ppt "Central Metatarsal Fractures"
Alterations of Musculoskeletal Function Chapter 42 Mosby items and derived items © 2010, 2006 by Mosby, Inc., an affiliate of Elsevier Inc.
Common Upper Limb Fractures By Chris Pullen. Re-written by: Daniel Habashi Intertrochanteric Hip Fractures. © 2007 McGraw-Hill Higher Education. All rights reserved. 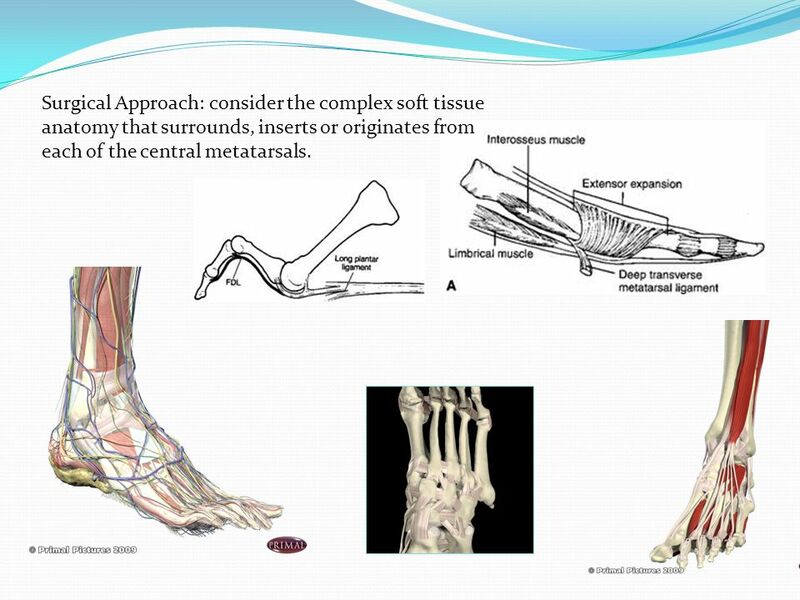 The Foot PE 236 Amber Giacomazzi, MS, ATC.